On Sunday, a giant tank sat by the side of an even bigger excavation at the Oak Grove School construction site. The sight of a mammoth tank at the Oak Grove School construction site in North Albany made me wonder what it’s for. I got the answer, but I’m still amazed at the varied and apparently ancient geology revealed by a huge excavation on the site. The tank holds 25,000 gallons, according to its label. It was made by ZCL Xerxes, a Canadian company with several manufacturing plants in the United States. 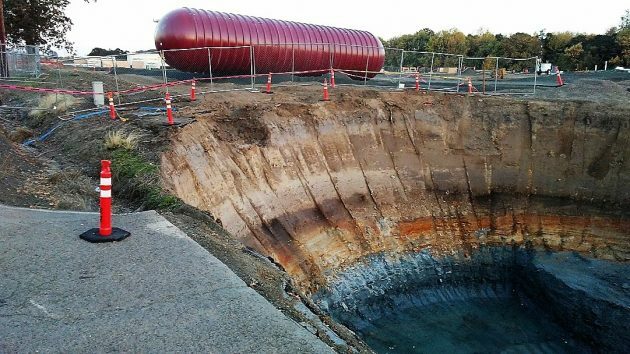 The company says it’s the largest maker of fiberglass underground storage tanks in the world. This particular tank is intended to hold wastewater generated at the new school, which lies outside the Albany city limits. After Albany built a sewer system in the part of North Albany annexed to the city in June 1991, the school district laid a pipe from Oak Grove School to hook up to the new sewer in Scenic Drive, about a quarter-mile away. The pipe, however, is not big enough to handle the load from the new and bigger school. The solution? The big tank, which will hold the school’s wastewater for the time it takes to pump it to the city sewer. Oak Grove enrolled about 290 last school year. The old buildings have been demolished and are being replaced by a new school with a two-story classroom wing that will have room for up to 500 pupils. At an estimated cost of $26 million, Oak Grove is part of the Greater Albany School District’s $187 million program to build one new school (Meadow Ridge), replace Oak Grove, and remodel and enlarge South and West high schools, among many other projects. At Oak Grove, Gerding Builders of Corvallis is the general contractor. Passersby on Oak Grove Drive have a close-up view of the project and report that the construction seems to be making good progress toward the goal of opening the new school in time for the 2019-20 year. The tank the way it looked Sunday from the construction fence on Oak Grove Drive. We too were wondering what that monstrosity was intended for. I need to drive by and see that hole. From your photo, the soil layers look fascinating. And just today we saw that the building’s walls are going up. Thank you, Mr. Hering, for the explanation. 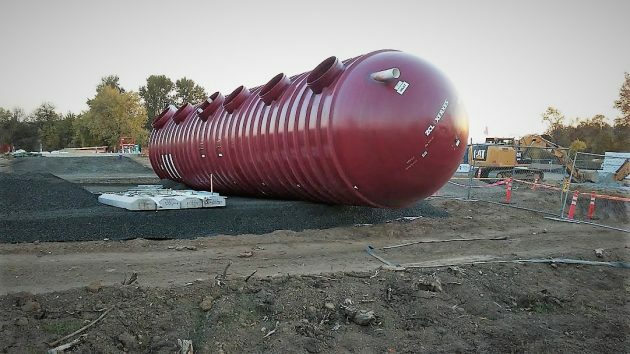 I, now, have an answer to the question off, ” I wonder what that tank is for?” when we drive by. Thanks for the answer and research! I live very close and everyone asks and expects me to know “what is the tank for” and “why the big hole”? Now we finally know. Interesting about the colors in the hole. By the way ~ it looks like walls started going up yesterday. Good. Now we know more of the story. And…….. the tank does it’s disappearing act! The 25,000 gallon fiberglass tank is actually 2 tanks. One side receives the wastewater. The other half is an enclosed pump station, that does as the author stated and pumps the material to the mainline running parallel with Scenic drive. Credit to the author for bringing answers to the public The bottom of the tank by design is set 22 feet below the finished grade of the school site. The hole was excavated to accommodate a safe working area for my crew to occupy the site for the installation and securing of the tank. Excellent write up and research. A private fee fishing pond about 2 miles due west was excavated in 1968 and they found a mastadon tusk. Super interesting area. I believe that the Democrat reported on it because I was 8 in the pic, holding the tusk.